이 책은 구마라습이 한문으로 번역하고, 계환(戒環)의 풀이와 일여(一如)의 주석모음이 붙은 법화경을, 세조 9년(1463)에 본문과 계환의 풀이부분만 한글로 번역한 것이다. 세조 7년(1461) 불경을 한글로 풀이하여 간행하기 위해 설치한 간경도감(刊經都監)에서 목판에 새겨 닥종이에 찍어낸 것으로, 상(82장)·하(82-202장) 2책으로 되어있다. 책의 형태는 글씨가 밖으로 나오도록 반으로 접어 겹겹이 포갠 후 몸통을 꿰매고 표지로 감싼 포배장이다. 비록 1권 뿐이나 상·하권 첫머리에 교정을 했음을 알려주는 도장이 찍혀 있는 초판 인쇄본으로 보존상태가 양호하다. Saddharmapundarika Sutra (Lotus Sutra) is the principal scripture of the Cheontae Order of Korean Buddhism. The main idea of the book is that the way to become a Buddha is open to everyone. Along with the Avatamsaka Sutra (Flower Garland Sutra), this sutra was a principal scripture that wielded great influence on the establishment of Buddhist thoughts in Korea. 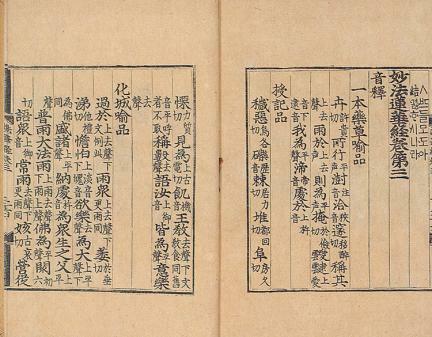 Saddharmapundarika Sutra was first translated into Chinese by Kumarajiva of the Later Qin and annotated by Jiehuan of the Song Dynasty and Yiru of the Ming Dynasty. 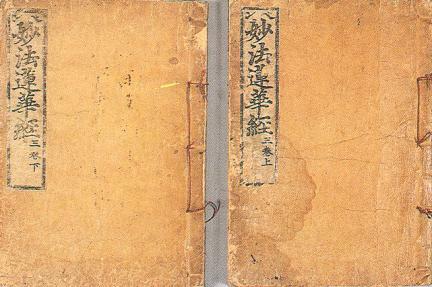 In 1463 (ninth year of the reign of King Sejo of the Joseon Dynasty), the main text and the annotations by Jiehuan were translated into Korean, and the translation was printed on mulberry paper using woodblocks by Gangyeong Dogam (or Directorate of Buddhist Publications). This book has two volumes consisting of a total of 202 pages: the first one has 82 pages, and the second one, 120 pages. Each page of the book is folded in half so that its characters are visible from the outside, and all the pages are then bound together in the middle. Finally, they are wrapped in a cover. 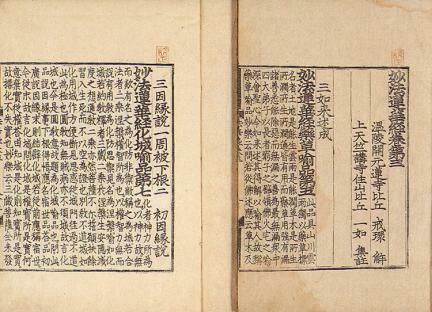 Only one original book remains, and a seal showing that they were amended is affixed on each of the prefaces of the first and second volumes. It has been preserved in good condition.